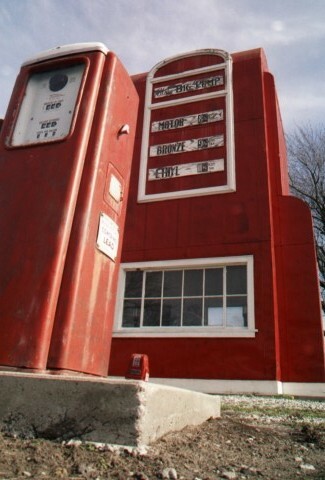 Over 45 years ago (this was written in 1983-4) Kyle Phares, the owner of a gas station in Maryville, Missouri, bought a new electric gas pump... 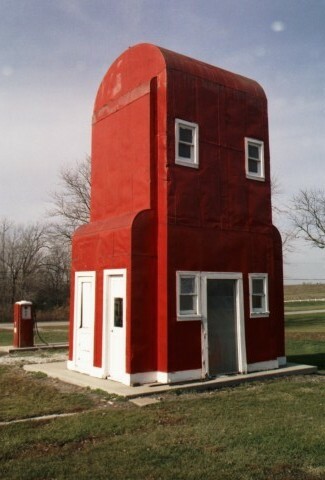 He was so enamored of the new pump that he decided to build a larger-than-life replica to house the station's office and rest rooms. Built by Charles Foster of H.L. Foster & Sons, of wooden 2x4s covered with galvanized metal. Painted black-and-white.